After a long, long period of developing and testing, we finally launched the 3.0 version of our Magento catalog manager tool: Tigermin. In this blogpost we will sneak peek into a couple of the amazing new features. We thank all Tigermin users for their valuable input and feature requests. For those new here, you are probably wondering what Tigermin is? Tigermin is an all-in catalog management tool for Magento, making catalog management incredible easy and fast. Save lots of time by managing your catalog easier and more efficient. Our completely customizable tool allows you to add products in bulk, edit products directly from an overview, search and sort products on custom attributes, and much, much more. Please try our live demo installation to see it yourself. Also make sure to check out our video and blogs for more information and tutorials / how to`s. So, what`s new with Tigermin 3.0? For a complete list of new features, please download Tigermin from your Emvee Solutions account and check the version.txt file inside the package. For those currently using Tigermin 1.x: please note that there have already been a lot of improvements since 1.x such as configurable products support, multi-store / multi-website support, multiple attribute sets / forms, and much more. Read our other blogposts for more information. I will now explain a couple of new features which have been released as of Tigermin 3.x. 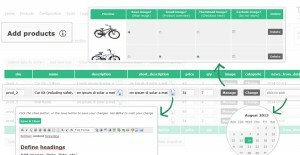 We added lots of editing possibilities for the product overview / edit grid. You can now inline edit images, categories, dropdown fields, richtext fields, all from a single overview just by clicking the value. For example, click the image to open the editor, click the categories cell to edit categories, etc. You can now search every individual column on the product overview and save your searches / filters to preload your form with those filters. This is ideal if you for example want two product overview: one for configurable products and one for simple products. But of course, you can use it for any case you want. The product overview now has a series of buttons: Edit (edit multiple product fields in popup), Delete, Export, Print, Select All, Deselect All, Reload form data, Save column searches. Export your products to Excel, CSV or PDF. All columns you have configured for the overview will be exported. 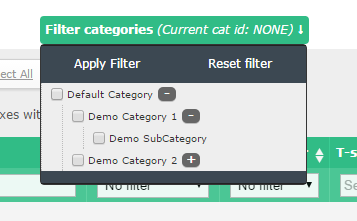 The categories filter is now a multiselect filter! This was often requested since in Tigermin 2.x you could only filter one categorie at a time. You can now filter all the categories you want! The categories filter and storeview filter are now remembered during your session. Make sure to check out our updated tour where we added new screenshots and a slider for the product overview section explaining the new functionalities. 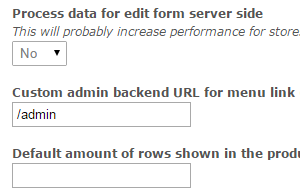 We added a setting to process data server side or not. This setting can make a huge performance difference. Set it to Yes for large catalog stores and set it to No for small catalog stores to gain best performance. You can now set a default page size for the product overview grid. Previously it would only show 10 product records but you can now define any amount you want. The Magento backend menu item is now customizable. For example if your magento backend is not under /admin but under /adminpanel or something like that, you can now change the link. You can now define the column width for as well columns on your product add grid, as on your product overview / edit grid. If you add a new field / attribute to your form you can choose from a list of standard attributes, but you can now also choose from a list of custom attributes which you have added in Magento backend. We added a couple of new default attributes, for example the attribute ‘url_path’. If you add this attribute to your product overview form, it will show a clickable deeplink to your product in the frontend of your webshop. 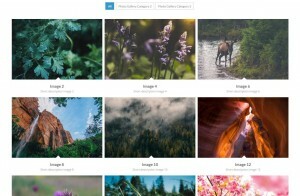 Adding and editing images now supports adding ALT-tags to the image (description of the image). TigerMin dashboard now has 6 shortcut blocks to directly jump to a section you often use. We also added a support block so you can easily ask for support. The support section on our website has been extended with several articles and a FAQ has been added. We launched a resell /affiliate program! If you want to buy more Tigermin licenses for yourself or if you want to resell Tigermin to your connections, customers or friends, make sure to checkout our resell page. Furthermore Tigermin 3.0 comes with a lot of bugfixes, improvements, more helptexts, better navigation, improved login / install process, and much more. I hope you are as thrilled about this new release as we are! This has been one of the biggest release in the Tigermin history and this is such a great step forward to our already so well received Magento catalog management tool.